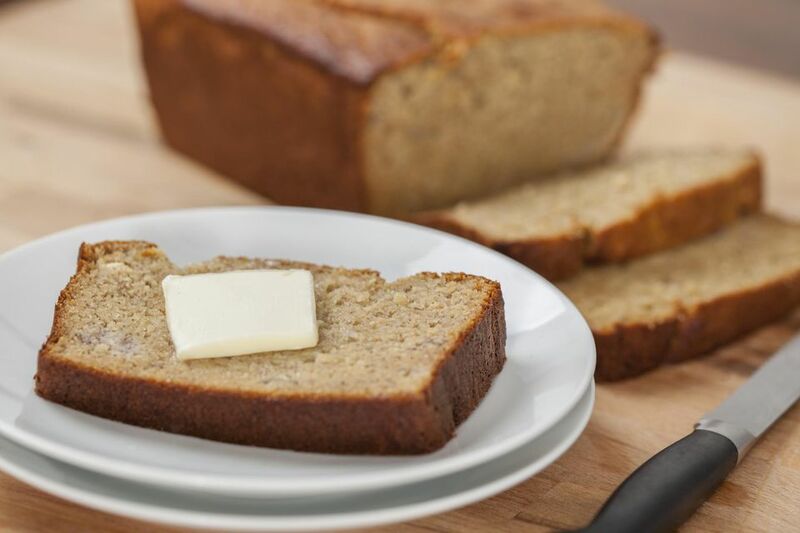 This moist banana bread recipe helps put overripe bananas, that would otherwise be destined for the garbage, to good use. That makes it a great recipe for anyone who hates wasting bananas, as well as anyone who loves moist banana bread. What makes it so moist? We use oil instead of butter, for one thing, which makes sense since oil is liquid at room temperature whereas butter is solid, and will continue to be after the bread is baked and cooled. Also, it uses two eggs instead of the typical one that you'll find in a lot of quick bread recipes. The egg also imparts moisture to the bread. Finally, the bananas themselves provide significant moisture. If you wanted to, you could add half a cup of milk or plain yogurt to the egg mixture at step 5. For that matter, you could use banana yogurt if you happen to have that on hand. The key to good quick bread is not overmixing the batter. Once the liquid ingredients are added to the dry, mix the batter by hand just until the flour is moistened, which should take not much longer than about 10 seconds. Too much mixing can cause the final product to be dry, tough, or misshapen. Add in the nuts with the dry ingredients, instead of folding them into the batter right before baking. This ensures that they will not sink to the bottom of the loaf. This trick works with blueberries, chocolate chips, or any other add-ins. Speaking of chocolate, for a slightly more decadent banana bread recipe, you might want to give chocolate chip banana bread a try. Preheat oven to 375 F. Thoroughly grease a 9-inch loaf pan. In a large mixing bowl, combine the flour, baking powder, baking soda, salt, cinnamon, and walnuts. Peel the bananas and mash them in a separate mixing bowl using a potato masher or a fork. It is OK if it is slightly lumpy. Stir the oil into the mashed bananas and mix until well blended. In a separate bowl, beat the eggs, then add the sugar and beat until dissolved. Stir in the vanilla, then add the egg mixture to the banana mixture and stir until combined. Add the liquid ingredients to the dry ingredients and mix gently until there are no more pockets of dry flour. The batter will be visibly lumpy. That is OK. It is extremely important not to overmix the batter, or the resulting bread will be too hard. Once the liquid and dry ingredients have been combined, gently pour the batter into your prepared loaf pan and transfer to the oven immediately. As soon as the wet and dry ingredients have been combined with each other, the liquid will (partially) activate the baking powder and the batter must be baked right away. TIP: The dry ingredients (on its own) and the wet ingredients (on its own) can be mixed in advance. Bake 50 minutes or until a toothpick inserted into the center of the loaf comes out clean. Remove the pan from the oven and let it cool for 10 minutes. To remove the bread, carefully invert the pan—the loaf should drop right out, so make sure you support it with your other hand. Let the loaf cool on a wire rack at room temperature. For a real treat, serve this banana bread drizzled with a creamy vanilla custard sauce called crème anglaise.